my B.O.B. - Sweet n Sasse — myblackbox co.
We were happy to introduce Sweet n Sasse through our my B.O.B. campaign on Instagram! We want you to know the vision and purpose behind the business. Through our blog, we can dig deeper into the stories and give you a fuller perspective! Sweet n Sasse was created at Angela Alexander's dining room table in Atlanta in 2011. She remembers staying up all night making gifts and jewelry for family and friends. Angela would pack up her creations to ship and then get ready for work bright and early the next morning. 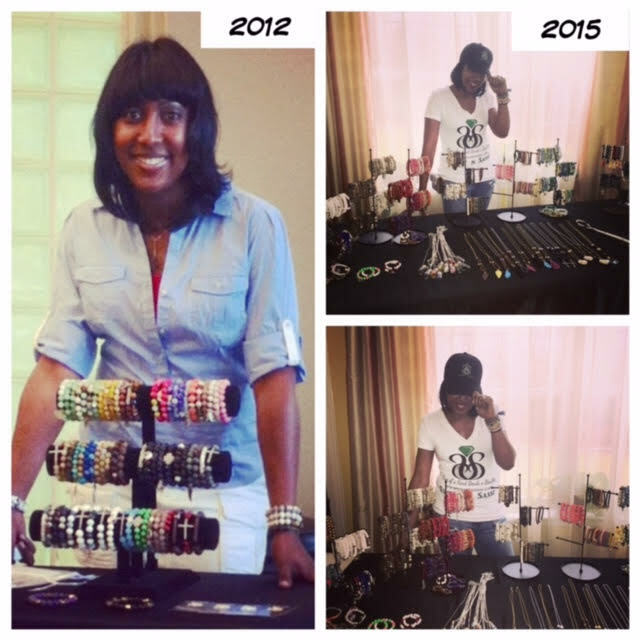 From there, her dining room table jewelry gifts grew quickly into a business. Have you always been into jewelry making? How did it begin? I've always loved making things and anything artistic ever since I could remember. Art classes, dance classes, music classes, etc. I started making jewelry around 2011 and enjoyed the creativity that it gave me. Beaded bracelets were only really seen on some celebs at that time. Russel Simmons had a collection of beaded jewelry and I thought to myself: I can make those. One of my girlfriends told me where a really cool shop was that carried natural stones for jewelry and I was hooked after that. How did the feature in UK Cosmo magazine come about? How did your business grow after the feature? I received an email from a young lady from CosmoUK regarding featuring my jewelry as a "Summer Must-Have". I remember I thought it might be spam but I called my dad and told him. He suggested I contact the NYC Cosmo office and ask if that young lady worked for the company. I did just that and she was 100% legitimate. After that, we corresponded via email and I sent her the necessary information. I inquired how I was selected and she said she saw my work on Twitter and loved it! As far as growth, I think that was the extra umph I needed. She sent me the "As Seen In Cosmo" banner and said I could use that as long as I wanted. I think when potential clients see that it kinda amazes them *laughs*. Have you ever been at a point with your business where you wanted to give up? What kept you going? I got married in 2013 and actually slowed down on my business. This was my second marriage and I moved to DC from Atlanta, leaving all my family and friends behind. I wanted to make sure I dedicated the necessary time to my marriage since my husband was Active Duty Air Force. I remember my 2014 New Year's Resolution was to "get back on my SnS hustle". It was hard being in a new state and trying to get clients there. I had a website but it was bare minimum. I knew that if I just found the right niche I would be just as successful. So I did several vendor events, and after that I was back in business. What do you love most about Sweet n Sasse? 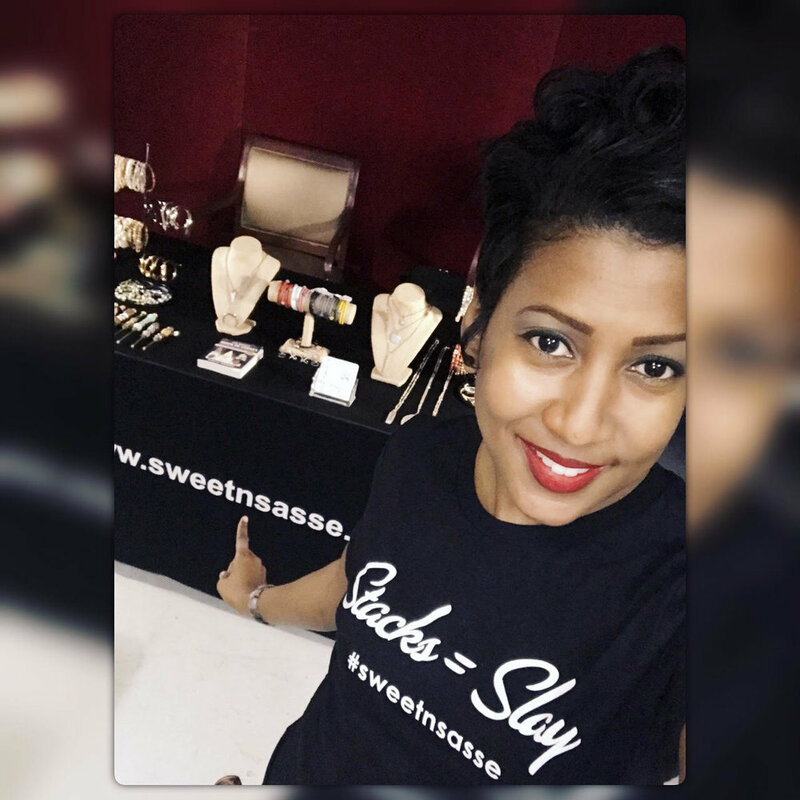 What I love most about Sweet n Sasse is that it's MY BLACK OWNED BUSINESS! I created it from an idea and no one can take that away from me. I've seen how much I've grown from 2011 until now and it still amazes me. What advice would you share with another jewelry designer just starting out and wanting to grow? I would say be PATIENT. It takes money to make money. Figure out what you want to do and stick with it. Also, set a standard of excellence for yourself and let nothing or no one change that! Make sure to check out the full line of jewelry by Sweet n Sasse here. It was such a pleasure learning more about Angela's story and we are wishing her continued success!